Pick your own cherries from more than 700 trees -- both sweet and tart varieties! We also offer pre-picked cherries in our retail barn. We'll be happy to show you how the cherries are grown in high tunnels for the best quality and freshness. 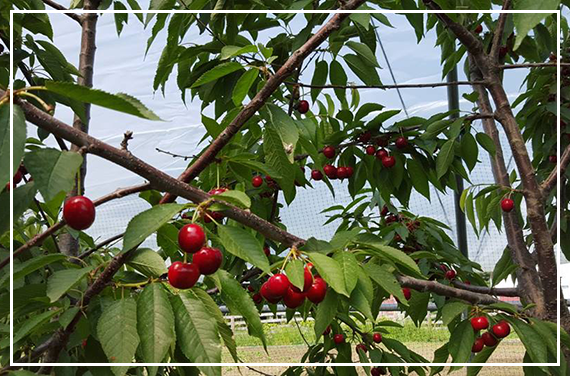 At Blossom Hill Orchard, we offer locally grown, tree-ripened cherries in the Fort Wayne and Northeast Indiana area. No more will you have to drive several hours to go pick your own cherries! We are a family-owned-and-operated business with more than 45 years of experience. The family has owned and operated an apple orchard for many years and, in 2012, we started up an offshoot of the business as a "you pick" cherry farm. Blossom Hill Orchard grows 12 varieties of sweet cherries and four varieties of tart cherries. We've only just begun to grow, so look forward to us adding more fruit and products in the coming years. Make some memories by spending a day picking with family and friends, enjoying the flavor of multiple varieties that we grow in our high tunnels.